When you get your vegi’s once a week in a box, you can sometimes accumulate things beyond belief!!! 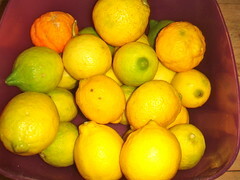 I had a curiosity question last week: “What am I doing with all the accumulated ginger and lemons that are arriving in our box?” Not only in our box, but the father person also tends to buy bargains when he sees them. By bulk and save, is a logo at one of our local supermarkets and it always makes me smile! Some of their buy bulk savings aren’t enough for one item each in our family… but there definitely is a time and a place for spotting a bargain and doing something constructive with it. I thought I would tackle a list of se7en things that can easily accumulate in the vegetable department and what to do about them before it is too late. Lemons: Lemon’s make a home that’s for sure and we use them to flavor everything from roast dinners to keeping salads crunchy. Really we use them at every meal – and when you live with a celebrity chef/zester it becomes even more relevant! Here are our lemon links – and we have a few! 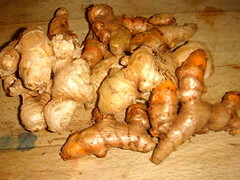 The culinary and the medicinal sides of ginger. Crystallized Ginger: Peel and thinly slice your ginger. Cover it with water and simmer for about forty-five minutes. Drain the water and weigh the cooked ginger. Return the ginger to the pot with the same weight in sugar. Add about three tablespoons of water and simmer again until the water has almost evaporated. Pop it onto to a dish to cool and strong flavored as it is the next time I looked the dish was empty! This stores well in a jar and I was going to say use it as a gift for those folk that like it but we won’t be gifting ours because it’s gone! Now if your “ginger” turns out to be bright orange and your fingers are stained yellow for days then it’s not ginger at all – It’s turmeric!!! 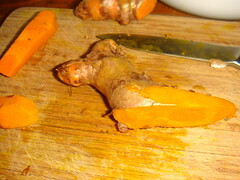 Most turmeric recipes call for ground turmeric, but I am wondering if you can’t just drop a chunk into your pot of rice and then whip it out before you serve it? What’s not to love, Apartment Therapy! Read through the comments for heaps of tips. And Wikipedia, if like me you were taken completely by surprise! 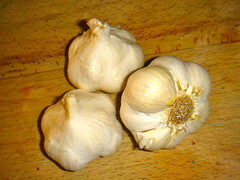 Garlic: I am a firm believer in garlic and use it whenever I can. I only just discovered that a clove of garlic is not actually the whole head, and I thought all those recipes where crying out for heads of garlic. Needless to say we are probably reeking the countryside out!!! When I have a couple of heads gathering on my counter I tackle them all at once: Top and tail each clove, then make a slit down the side and the skin pops off. Toss all your cloves into a glass jar and cover with olive oil in the fridge. I would say it stores for ages, but it gets used too fast to know! Once it is in the fridge and all the preparation is done you can just use it whenever you need it, a clove or a fistful at a time! We use whole cloves anytime I roast anything or slivered (I know you should crush it but I have yet to find the perfect crusher) on pizza. Butternut: When I have one or two I just peel away and make quick soup with them, that everyone eats! Brown an onion and some garlic cloves. Add the butternut chunks, cook in vegetable stock for fifteen minutes. Pop it in the blender and you are ready to serve. But occasionally our family shopper, the father person, will come home with a sack of them – fifteen butternuts cannot be consumed, even by all of us, before they are beyond eating. This calls for a bit more action than a fifteen minute soup. I split them in half and remove the pips. Lay them on baking trays and douse them with olive oil and salt and pepper. Bake them in a medium oven until they are soft. Let them cool. Once they are cool you can easily spoon out the contents (trust me no-one ever wants to peel fifteen butternuts!) and freeze it in ziplock backs. 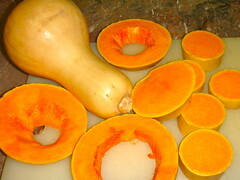 Ready to add to soups or any recipes that are suitable for butternut. 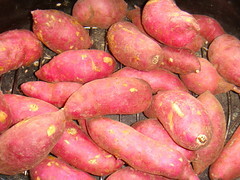 Sweet Potatoes: Now these come in our vegi-box and can accumulate quite quickly if I don’t watch out. I serve these as a yummy tea-time treat and we are having just the right wintry weather for them. Yes those hoods are munching up vegetables as a treat – it is all about marketing!!! Cut them length ways in half and in half again, and in half again. Pop them in the biggest bowl you own. When your bowl is full sprinkle them with some brown sugar and cinnamon. Drizzle with olive oil and toss. Lay them on baking trays and roast in a hot oven until they are crispy. Eat them up while they are warm and crispy. 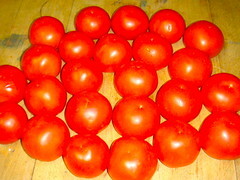 Tomatoes: I love tomatoes, really they make a home complete. The father person knows if he sees tomatoes on special that he must grab them. Yes there are a couple of us that eat tomatoes like other people eat apples – totally yum! But occasionally supply beats the demand… and then I make pasta sauce to die for and store it in the fridge. We don’t just use it for pasta, but pizza bases, soups whatever! Chop your tomatoes in half and half and half again… toss them into a roasting pan and drizzle with olive oil, heaps of salt and pepper. I add in clomps of garlic and roast the whole lot into the hottest oven until they start to brown and crisp. Let them cool slightly and pop it into the blender. I add a dollop of Basalmic vinegar and then blend away. You get this lovely silky pale orange sauce that my non-tomato eaters don’t recognize as tomatoes!!! You can store this in jars in the fridge and use whenever you need it. Yet another thing that everyone eats. Oranges: There is only one thing to do with sacks of oranges… set some hoods to work! 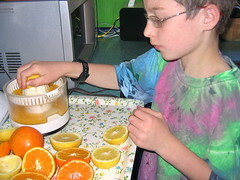 Our kids never drink juice I would much rather they ate fruit then drank store juice. 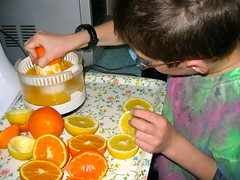 So when we have pockets of oranges it is a real treat to have juice and it is well worth the effort! I grew up with a hedge of citrus trees and my mother spent weeks making marmalade every year I know I should master the art and I will have to learn. Maybe this season is the time to learn. I just remember the delicious smells and it seemed like a lot of work, maybe I should set some hoods to work on marmelade too. I know my se7en ingredients are up but we have a 6 year old Hood, who is mad for chili’s and everytime he goes shopping with the father person he comes home with a couple of chilis. They add up fast and what am I to do with them all? I guess he could have worse vices!!! 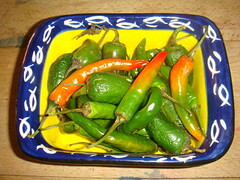 But if anyone knows what to do with about a million chilis a month – when the rest of the se7en are not exactly mad for them – well just let me know… I am open to all suggestions on this one! thx a mil for responding to my qustions!! I also thought those orange gingers were ginger … they sure do taste like it!! Hi T, Hope this post covered all the bases for you! Yeah those orange colored gingers were somewhat of a surprise!!! We had to go and do some research on those – great fun!!! Thanks for the great question!!! Hope you guys have a great weekend – don’t freeze to death!!! Was off-line for a few days and came back to find this post. What a fantastic post! Just what I needed! Wonderful ideas that were quick and delicious and solved my tomato, garlic and sweet potato deluge for me! Yippee and thanks! Hay Jack! Glad you liked the post, hope you guys all have a great week ! Pampered Chef has the best garlic press!! What about chopping up chillis with garlic cloves into small glass jars covered with olive oil as a perfect present for another adult person? We bought a mix like this at a farmers market in Hermanus and it was divine. Hay K-R, Yup always a birthday! I promise no more until September!!! Luckily this little wild thing doesn’t demand projects but just tags onto every other person’s project!!! I hope your new little grandbaby is doing well. Have a good Week! Thank-you S, Our always collects clumps and is just a real pain! I will definitely have a look at the Pampered Chef! Thanks for commenting! Thanks T, Finally a chili response!!! That’s a great idea… I am so desperate I will have to try it! You all have a good week! I don’t have a recipe though. Hi V, Thanks for the suggestion- I am going to google a recipe for this! Thanks for the idea. Have a good week! Love this post and can’t believe I missed it! I’ve been slowly working on utilizing our freezer more, especially for veggies and this is perfect as we crawl slowly toward spring and get started on our garden – I want to savor every bit of our own produce! Hi L, We are so enjoying our keyhole garden right now – heaps of lettuce every day and he second batch of tomatoes are due!! I could go on just to say – loving the gardening!!! Glad you liked the post – there is nothing worse than a heap of vegi’s and looking at them and them looking back at you!!!! Have a great week!! !